This is a neat research problem I came across. The idea is that you start with a total of “n” unit squares and you want to pack them into an object with a particular shape, in this case, we’ll pack these “n” unit squares into another square. The goal is to minimize the size of the object you’re packing these unit squares into. 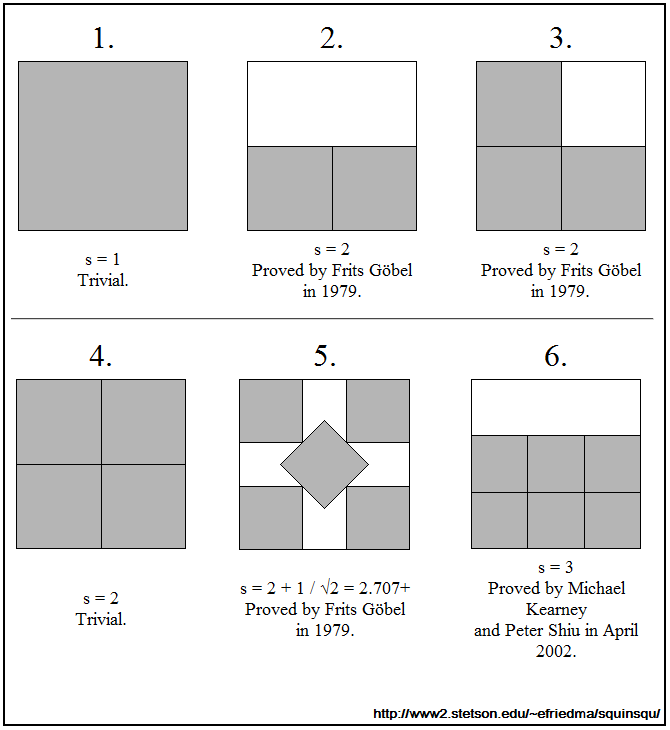 Six examples are given below (via http://www2.stetson.edu/~efriedma/squinsqu/ the expert on this problem!). As you can see above, to pack ONE unit square into a square, the smallest such square is of side length s=1. To pack TWO, THREE or FOUR unit squares into a “larger square” then it can be shown that the smallest such “larger square” has side length 2. Once you hit 5 unit squares and need to pack them into a “larger square” things start to get interesting. Though this case is also rather easy to solve on your own. Definitely check out the images for other cases of “n”. It is an open problem when n=11. That is, given 11 unit squares, what is the SMALLEST square you can pack them into?